For Finn's birthday, his rocket scientist relatives Auntie Sudi and Uncle Clintie gave him a mini rocketship to ride around on. (Apparently this is how Eileen Collins got her start as a child?) Up until recently, his legs have been too short to reach the rocket's appropriate scooting potential. 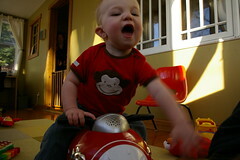 But those Hazen legs have grown and he's now vrooming his rocket all over the playroom. Thanks, Auntie Sudi and Uncle Clintie! He just loves it. You are so your father's son. 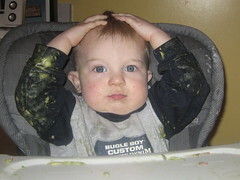 Here you are, not even 18 months, and you're already pawing at Paris Hilton. Papazao would be proud. Is this thing on... ? Finn is nothing if not a cutup. 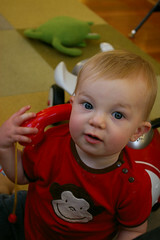 Here he is holding his play phone up to his ear, saying "hello? hello?" He also uses everything from stuffed animals to cookies to play on the phone. This morning, when I dropped him off at daycare, two of the girls were already there, and seated at the breakfast table. 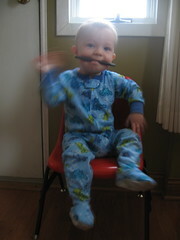 As soon as Finn was clicked into his highchair, he immediately started entertaining them. He first made sure he had their attention by flirting with them--giving them big smiles and waving. Then he started putting anything he could find on his head. (A patented baby way of warming up the crowd.) He finished with shaking his head from side-to-side, giggling. Finn was lucky to have not one--but two--grandmas here this Thanksgiving. This gave him even more people to wow with his emerging Frankenstein walk, growing vocabulary (most recent entry "No!" said with a pointed finger), husky laugh, and mischevious pranks (pulling the register grate off and throwing all his toys inside). 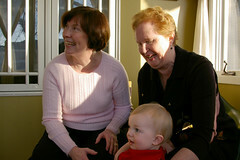 It's clear that Finn really loved spending time with his Nana and Gamrene. And cranberry sauce. Finn also discovered that he really loves cranberry sauce. 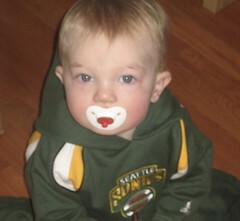 Here's Finn in the Sonics warm-up suit that his Uncle Mike and Auntie Julie bought him. It's early in the morning, so he looks a little groggy yet. But let us assure you that he warmed right up after he got his breakfast. 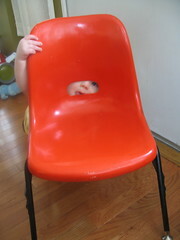 Here's Finn peeking from behind this new modern chair. He thinks playing peek-a-boo is just about the most hilarious game around. 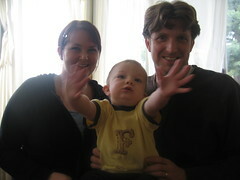 We were very lucky to have Auntie Julie and Uncle Mike visiting from Seattle this weekend. It was the first time we got to show them the house and the first time they got to experience Finn as a crazy toddler (verses the little guy who needed to be carried around everywhere). We had a great time visiting a bunch of different Chicago places, but mostly visiting local restaurants. Thanks for visiting, Uncle Mike and Auntie Julie! P.S. This is Finn's way of saying "Noooo! Don't go!" Everyone into the dog bed! We had grand plans for Finn's Halloween costume this year, but anything that required a hat or anything attached to the head was swiftly rejected by our muse. 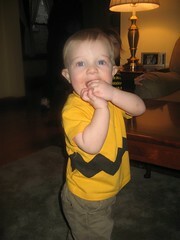 But we figured we had a natural with Charlie Brown. So even though he had to wear a heavy coat while we went trick-or-treating with the neighbor kids (costume=one-year-old in heavy jacket? 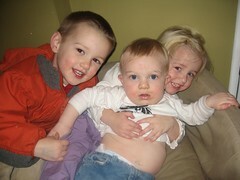 ), I think Finn had fun, even if it was just watching the big kids scramble up to houses to get their candy. Although we didn't get candy ourselves, there's enough leftover candy here to continue to tempt me from my weak commitment to my low-carb diet. Here are some fun photos from Finn's first real Halloween.